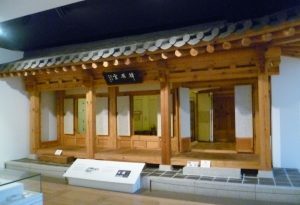 Korea is very much in the news just now, so I thought I’d visit the British Museum’s Korean Gallery to find out more about the two countries; after all North and South Korea share a long history, a language and, until the Second World War, a common culture. It is important that we know more about them. The first thing which struck me was how deep the principles of Confucianism are in Korean culture. Confucianism is not a religion, it is a way of life based on harmony, benevolence, justice, knowledge and integrity. This is clearly seen in the reconstructed full size sarangbang, pictured above. This is the traditional male space in an upper class dwelling, constructed from wood with a tiled roof, lattice doors and windows covered with white paper. The style of the interior furnishings are based on Confucian principles of clarity and simplicity, and you can glimpse them through the open doors. We also see the same principles in Korean pottery, where respect for the medium, be it stoneware or porcelain, is paramount. The earliest Silla pottery (400-450 A.D.) is stoneware and the examples above came from a tomb. They are simple but aesthetically pleasing, and the lid from the small jar just visible at the back has a neatly-turned finial. Stoneware Silla roof tile, 700-800 A.D. I rather liked the Silla stoneware roof tile above. 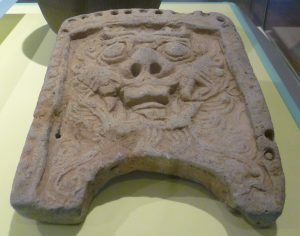 Tiles like this would have been used only in temples or the homes of the elite, and the monster’s face was believed to ward off evil spirits. 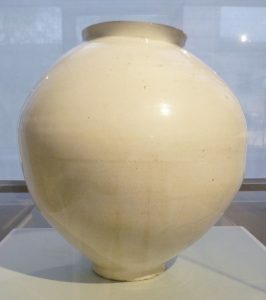 The Silla period of pottery was followed by the Goryeo period (920- 1400 A.D.) The pottery is still stoneware but a new technique has emerged: a monochrome celadon glaze. Technically, this is extremely difficult to control as it has to be fired at over 1250º centigrade and, at such a high temperature, colours can be volatile. 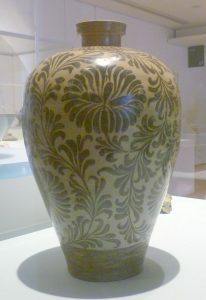 Celadon glaze pottery was inlaid with different coloured clays. I really like this bottle; it’s simple, elegant and I love the understated flowers. 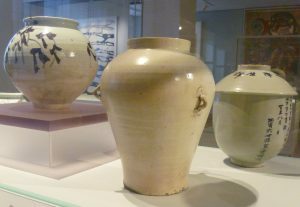 Much of what we know about Goryeo pottery comes from the 3000 shipwrecks discovered off the S.W. coast of Korea. These thirty-two bowls above in celadon-glazed stoneware were discovered on the ocean floor off Bian island, Gunsan. I admire the neat way they are ingeniously packed inside the wooden frame and they would have been wrapped in straw as well for extra protection. 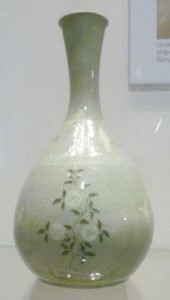 This beautiful bottle is Goryeo celadon glaze stoneware with under-glazed painted iron brown decoration. Given its early date, it strikes me as very sophisticated; it manages to be elaborate without being fussy. We know that similar bottles from shipwrecks once held honey or alcohol, so perhaps this one did, too. 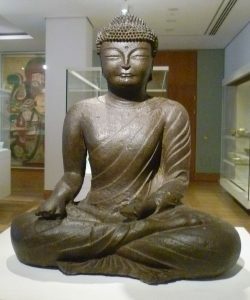 Buddhism spread from India to Korea in about 300.A.D. Commissioning a Buddha was thought to help secure the donor a favourable rebirth; and making offerings to the Buddha was a source of comfort when times were difficult. This Buddha is made of iron and they were often coated in lacquer and gilded. Goryeo style pottery gradually gave way to Joseon, see above. The jar in the middle is a placenta jar. It was the custom in aristocratic families to put a new-born baby’s umbilical cord and placenta in a jar. It was tightly bound up and placed inside two other jars and then buried to guarantee the well-being of the new baby. I loved the quietly understated Korean pottery, but, after a while, I longed for some Colour! 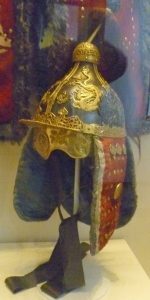 This splendid helmet is made out of leather, gilt bronze, silver, enamel, velvet, satin damask, and dyed horsehair. And the intricate craftsmanship indicates the owner’s status. It certainly makes a statement. 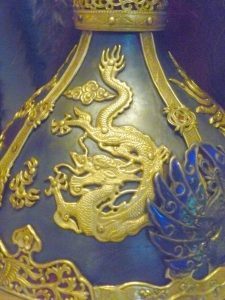 The detail on the helmet is in gilt bronze and depicts a dragon, symbol of strength and power. This moon jar was once owned by the renowned potter Bernard Leach. It is made of glazed porcelain and is emblematic of those Confucian virtues, austerity, frugality and purity. They are extremely difficult to make, being created in two halves and then put together. The success rate is very low; only one moon jar in ten survives the firing. The vase above was made by the potter, Yeesookyoung, from fragments of moon jars which didn’t survive the firing; she ‘translates’ or recycles the broken fragments to create new works. 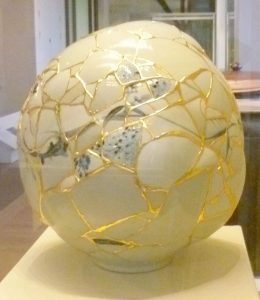 They comprise porcelain fragments, epoxy, lacquer and 24k gold leaf. The vase above is about the same size as a moon jar – that is, large. I rather like it; it’s honest about where the breaks are – she emphasizes the edges of the fragments with gold leaf. For me, it has a quirky beauty of its own. 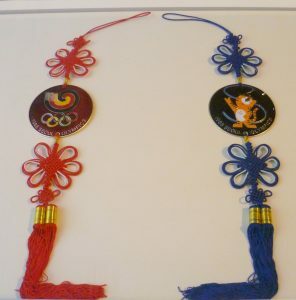 I’m ending with these decorative hangings from the Seoul Olympics in 1988. They are based on traditional designs and made up of elaborate knots which, both create patterns but also secure the circular enamelled medals in place. They come in pairs and have long tassels at the end. They were on sale at the Seoul Olympics as mementoes. So, there we are, my small contribution towards world peace. Gorgeous. Especially love the roof tile, the helmet and that reconstructed moon jar. I’m delighted you enjoyed it, Elizabeth. I, too, found those three objects intriguing – they bucked the trend, somehow. I really love the reconstructed moon jar, Elizabeth. But I was surprised when you said you were longing for colour. Having been to Korea — a long time ago, admittedly — I can tell you that the traditional Korean house style is hugely colourful, with lots of primary colours. I know I had pictures but, just at the moment, I can’t find them. Sorry. Thank you for your comment, Joanna. I’m delighted to hear about the colourful Korean houses! There were some large brightly-coloured hangings on the walls in the Korea Gallery, it is true, but it was impossible to photograph them – something to do with the way the gallery is lit. Most of the exhibits were pottery and the colours were muted. And what I could see of the furniture inside the sarangbang was either made of wood or brass or painted white.